Home Theater audio systems are complex and have many components - on the source side. These sources typically are connected to an audio/video processor. More often than not, as soon as you fire up the system there comes noise out of your speaker - most of the time you will hear a hum. In this paper we will focus on how to get rid of the hum - but first of all you will need to understand the nature of HUM. Many times HUM is confused with BUZZ. Most of you were taught that removing the third prong on the power plug is the solution - this is actually masking the problem rather than solving it. Hum is generated when some of the equipment has a ground that is different from another component. The ground difference causes the audio path to seek a lower ground ( 0-ohm) 80% of hum noise is attributed to the cable box. 15 % of the noise is attributed to long RCA runs. (1) What are the sources. CD, DVD, etc. (2) Does it have a cable box connected - typically the cable box ground is above zero ohm due to poor grounding. The solution is to connect an outside wire that connects the cable ground to the metal frame of the processor. You can also ground the frame of the cable box to the frame of the processor. (3) When you have more than 6 feet (1.8m) run, then it is best to use an RCA that has a positive conductor, a ground conductor, and one more shield conductor. The shield conductor is shorted only on the source side and open on the receiving unit. On the source side where it is shorted, it should be shorted between the ground and the shield. This is called source grounded wiring which reduces noise pick up. (4) You can break the ground from the plug. (5) In the event where two or more AC power outlets are used, joining the frame of the components in the system will often solve or greatly reduce the problem by itself. With different power sources together, a ground loop isolator can also be used. b. Disconnect the long run on the subwoofer and bring the subwoofer closer to the processor. Then use 3 feet long RCA. If this solves the problem, then you will need to use 3 conductor RCA (source grounded). Also you can improve the situation if the majority of gain is on the front end at the processor. 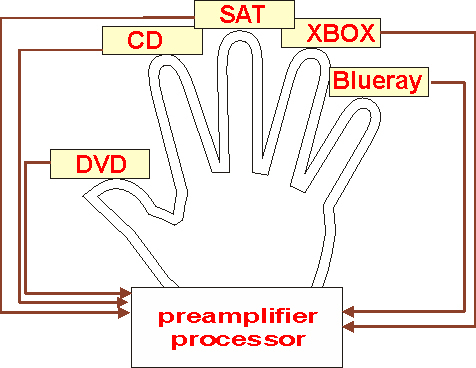 Meaning - reduce the woofer gain and increase the processor gain. c. Since the noise was not there, connect one source at the time. Look for the noise if it comes back. Each time add another source and test. The source that brings the noise out is the suspected one. Ground the frame of the offending component to the processor frame. - Alligator Wire to short the frame of the processor to the suspected source. - Ground loop isolator to use in line on the RCA, place it close to the subwoofer in order to kill all noise picked up along the way. In the event the processor has noise with nothing connected to it, your custom home installer should have a shorted RCA and a 600-Ohm shorted RCA as per the picture below. Then either one of these should be plugged on the input source that the processor is set to. Then with the input of the source being shorted, turn the system ON. Whatever noise level it shows, hissing, etc... that will be the noise floor of the unit. Note: Keep in mind that a component in the OFF position still produces ground hum. It’s a common occurrence in dish receivers and TV table top boxes. These often have poor grounding. Another cause of hum is electrically induced, this happens if very sensitive components are too close to a power transformer. Components like power amplifiers have big power transformers and can induce a magnetic field into other components or cables. If you suspect this may be the cause of the problems then putting more distance between the components is the only practical solution. Excessive noise in the AC mains can cause "buzz" in certain equipment . 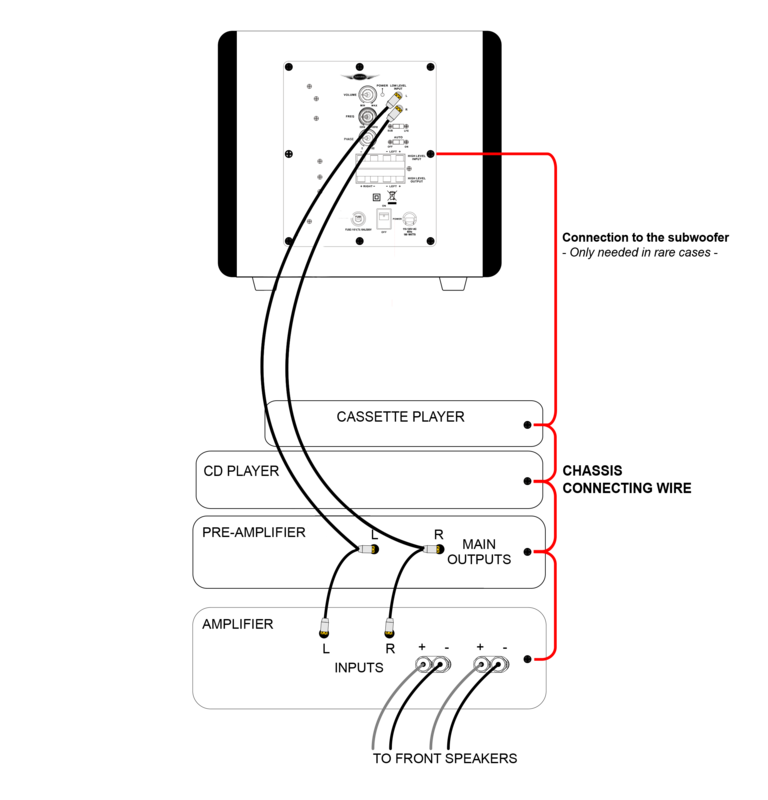 Lighting dimmers are notorious for sending noise into AC mains. If this is the problem put the lighting system on a different outlet. (Fig.1) Illustration of chassis connecting wire. This is done to equalize the voltage potential on the chassis. When all chassis have the same potential then no current will flow and hum is eliminated.